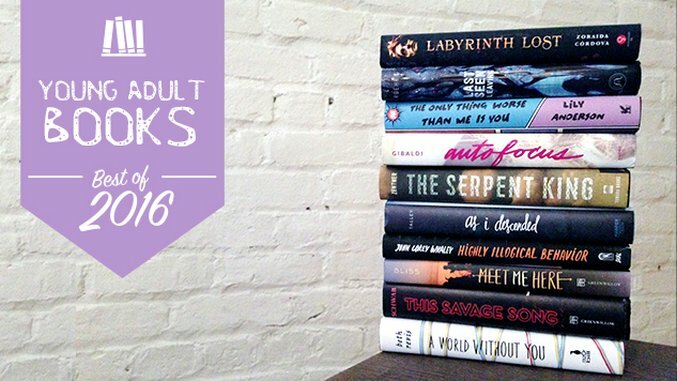 A quick scour of Goodreads will tell you that well over 1,000 Young Adult novels were released in 2016. It’s impossible to read all of them in a single year—believe me, I’ve tried. But the 30 books on this list are some of my favorites. Looking for debuts that bring on the tears (The Serpent King) or adventures into wildly imagined worlds (The Abyss Surrounds Us)? How about sequels to bestsellers (A Torch Against the Night) or conclusions to beloved series (The Midnight Star)? It’s all here, so read on and get ready. Chances are you know Lee’s work. Her YA historical novels Under a Painted Sky and Outrun the Moon transport readers to the 1850s and 1900s, introducing diverse characters and plots that keep you hooked. But with her latest, Lee writes less about history and more about love—with a bit of magical realism tossed in the mix. The Secret of a Heart Note’s protagonist is Mimosa, a teen aromateur. What’s that? Well, she uses her sensitive sense of smell to mix love potions. But if she lets herself fall in love, she’ll lose her gift forever. So what happens when Mimosa wants to fall in love? Does she sacrifice it for her gift, or follow her heart? This warm and totally sweet novel is all about discovering the courage to make your own choices. If you’re unfamiliar with Lu’s Young Elites series, it’s like traditional fantasy blended with the X-Men (when they’re being hunted down by people who fear them). And much like the X-Men’s powers, magic is misunderstood and those with abilities are fighting for control. Full of thrills and intrigue, the trilogy traces kingdoms as they rise and fall in a world where no one is as good as they seem. The final book, The Midnight Star, wraps it up with a bang. When characters know the end of the world is coming, it makes their actions all the more interesting. From stories like The Last Policeman to Station Eleven, pre-apocalyptic novels and their impending doom place characters under a microscope. That’s the case here with Duyvis’ second YA novel, in which a teen girl is waiting out a comet set to annihilate most of life on earth. But then hope surfaces in the form of a ship leaving the planet to colonize new worlds. The catch? Everyone needs to contribute on the ship, and the protagonist, Denise, is autistic and is afraid she won’t make the cut. This is a compelling, standalone story about family ties, disability, and the need to survive. Rutkoski’s The Winner’s Kiss makes us say goodbye to a beloved YA fantasy series, The Winner’s Trilogy. I’ll avoid spoilers for those of you who haven’t dug into the series, but Rutkoski’s lush fantasy romance is set in a world of politics, war, and scheming. It’s also a story of forbidden love between the privileged daughter of a general and a teen from a class of people her father has conquered. From the music to the balls to the swoon-filled romances, this is a gorgeous series the YA community is sad to see go. But we can’t wait to see what Rutkoski writes next. In Whaley’s latest, we meet an agoraphobic teenager named Solomon who hasn’t left his home in over three years. He wrestles with crippling anxiety, but thankfully he’s been gifted with some amazing parents and a haven in the garage—that’s been painted to look like the holodeck from Star Trek. Starting to understand that cover and the “highly illogical” in the title? Solomon’s life changes when a former classmate, Lisa, decides to use him as part of her college application process. If she can “fix” him, maybe she is cut out to be a psychologist. If this is making you cringe, it’s supposed to. All of their awkward moments together feel so, so real—especially when her boyfriend and Solomon start to get really close. This book about mental health and friendships is as incredibly sweet as it is incredibly geeky. I’m going to go ahead and declare Córdova’s Brooklyn Brujas the best new series of the year. In the first book, Labyrinth Lost we meet Alex, a teen bruja who is the most powerful witch in her family—and wants nothing to do with her gifts. But her entire family disappears when she uses her magic to get rid of her powers, and she’ll have to travel through the realm of Los Lagos to reclaim them. It’s a diverse, beautiful read that blends Latin American culture and high fantasy, and it was recently nominated for the 2017 Rainbow Book List to boot. We’re big Talley fans here at Paste, and you probably saw one of her books on our Best YA Novels of All Time list. She pens wonderfully inclusive novels, and her latest As I Descended, introduces a touch of magic to her growing library. We’ve all heard stories of teenagers vying to be the top of their class, but what happens when you throw ancient powers into a mix of angry students with bitter rivalries? You get incredibly high stakes, especially when people start dying. It’s a Shakespeare-inspired story that draws from Macbeth, blending magical realism and gothic horror for one of the most engrossing reads of the year. Six of Crows, the first book in Bardugo’s duology, often gets compared to a fantasy version of Ocean’s Eleven and follows a band of teenagers executing a heist. And if Six of Crows is the heist, then Crooked Kingdom is the glorious getaway drive. Want to read about a grand scheme, involving magic, fighting, and all the joys of fantasy? These books are for you. And one of the truly great things about this duology is that if you haven’t read the previous books (The Grisha Trilogy) that take place in Bardugo’s fantastical world, you can still dive in. In A World Without You, we meet Bo, a teen who believes he can travel through time. So he’s sent to a school full of teens with special needs—and he believes they have superpowers. It’s here that he bonds with a girl and starts opening up in a way he never could before…until she commits suicide. Not willing to let go, he’s convinced she’s lost in time and that he has the power to save her. But we know he doesn’t, which makes it all the more heartbreaking as he falls deeper and deeper into his own head. It’s a contemporary YA novel. It’s a sci-fi novel. It’s a tragic love story that blends genres for something totally unique. Sepetys’ Out of the Easy and Between Shades of Gray were outstanding works of YA historical fiction, and her latest tackles the sinking of the Wilhelm Gustloff. In what was the biggest maritime tragedy in history—and one of the most overlooked—a German transport ship was sunk during WWII carrying civilians and thousands of children. Sepetys transports us to the ship through the viewpoints of four different teenagers, each carrying their own secrets. Salt to the Sea proves to be a novel full of heartbreak and hope that dives into a piece of forgotten history.